I don’t know who made this video, but God Bless ’em. Listen also to my informative interview with David Rivkin, who argued against Obamacare in the lower courts on behalf of the 26 states bringing the case against it. Find that here. I got through the race with the estimable Carrie Brownstein. Then I got through against Timber Joey. And every time Willamette Week has overtly pulled for my rivals. Now they’ve cut off voting for me. I know it’s for fun, but it makes you wonder what they bother to This while my rival’s buddies are voting for him multiple times. In fact, it was so ridiculous Eric the Great got video of it. Wild! See the video proof below. The following are tweets from Mike Rice’s Twitter feed that show they voted multiple times for him. Sorry about the formatting, having computer issues yesterday and for some reason the embed function wouldn’t properly work. They’re serviceable enough, however. 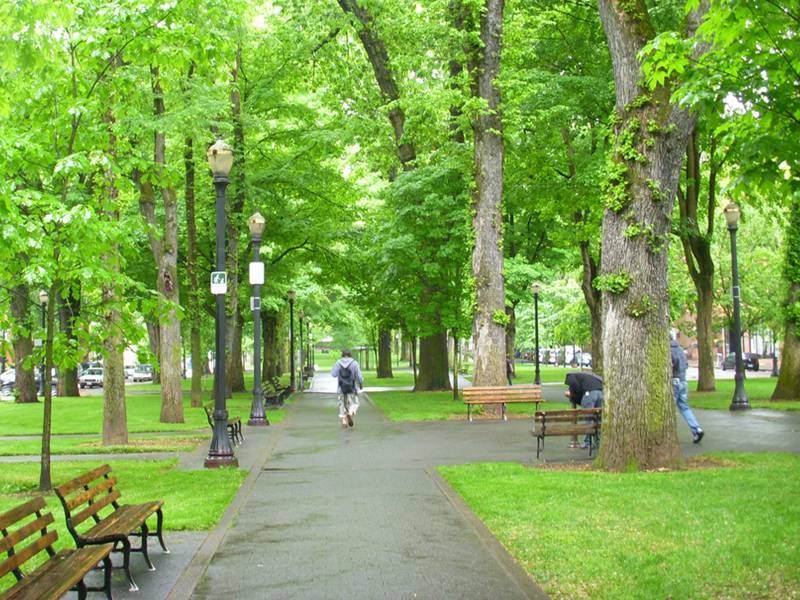 Did you know that Portland State University is now blighted? This jewel in the middle of the City, or whatever they call it on the tourist pamphlets, is now a slum. I’m not even kidding. It happened that fast. 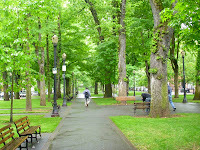 Like one of those HGTV shows where the designer magics a shed into something out of the pages of Elle Decor in under 30 minutes, Portland State University went from being a verdant oasis to Cabrini Green overnight. 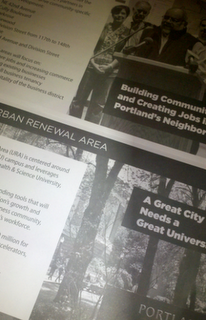 How else to explain that PSU is now the centerpiece in the latest urban renewal scheme? Planners have come up with a new urban renewal idea that even one of Portland’s elected officials labels “radical.” How radical? On The Bill Ayers Scale of Radical, with ten being Weather Underground Worthy, Portland is an eleven. Under the traditional rules of urban renewal (URA), areas that are run down and blighted are eligible to become URA’s. But as I’ve pointed out here, here and here, this isn’t your mama’s urban renewal. 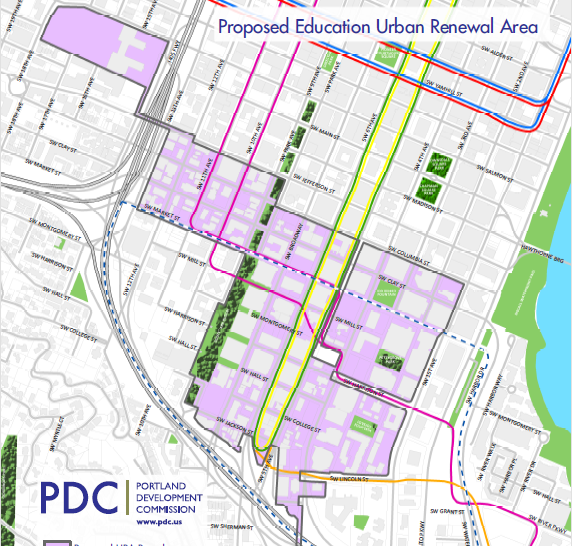 Portland’s planners have come up with a unique urban renewal zone: an “education URA.” Portland State University and Lincoln High School are a part of it (OHSU is also listed as a benefactor). While this is the only education URA, it is one of seven new urban renewal areas the City wants to establish. The education URA would last for 31 years. The smaller districts, nine years. These seven URA’s would establish seven pots of money from which Portland’s planners at the City would be able to spend within the district. For example if they want to pay developer Homer Williams a premium for parking spaces, call blank-scapes parks or pay off community groups with “scholarships”, as they propose to do with PCC (see previous posts), it will be done with URA money. But what happens to the rest of it? Besides paying planners at the Portland Development Commission (with the borrowed money), the rest becomes a wonderful pot from which to dispense largesse to friends and hush critics. It’s high rent walking-around money. It’s cash. For cronies. And it’s corrupt. Here are the nuts and bolts of it. Lawmakers freeze the level of property taxes in a URA. If taxes go up the additional dollars are skimmed off and tossed into a big bin of money. That money is used for the planned improvements to an area. 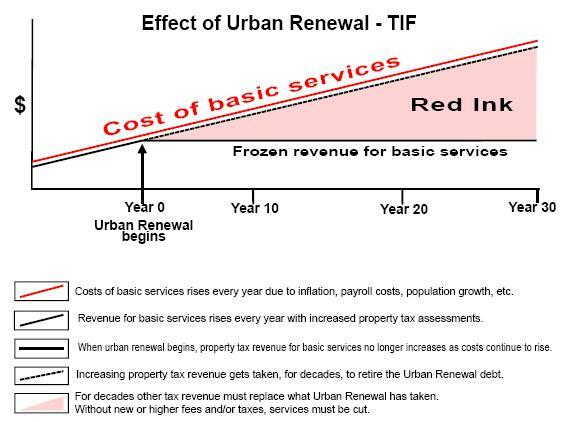 See the nearby chart on how urban renewal’s “tax increment financing” works. The problem is the additional property tax money is supposed to finance cops, schools, fire and the library. That’s why those other entities have to be bought off somehow. Portland Public Schools is getting Lincoln spruced up and probably other spiffs, grievance groups are being “hired” to sell the other URA’s which will get new paint and signs, but what does PSU get out of this deal? Keep reading. I don’t know where the sweet spot is vis a vis URA and City budgets, but 26% seems, ah, a little high. 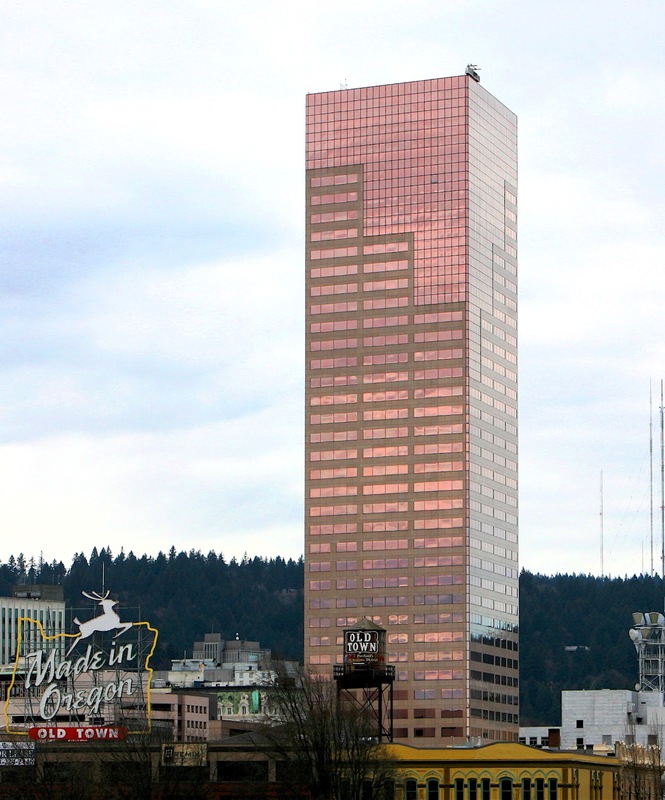 Lewis and Clark University tax law professor and fellow blogger, Jack Bogdanski, does a yearly analysis and finds that more than one quarter of every dollar in City of Portland tax receipts goes to pay for urban renewal debt service. Put another way: more than a quarter of the funding for public services have been eaten away by urban renewal. AND MAYOR SAM ADAMS AND THE PLANNER CLASS WANT TO CREATE SEVEN MORE URBAN RENEWAL AREAS. Here’s Jack’s recent post with graphs and pretty pictures and everything. Key in this discussion is the fact that PSU doesn’t pay property taxes. Government properties aren’t assessed property taxes. They do pay some taxes as I found out in a quick check of Portland maps. 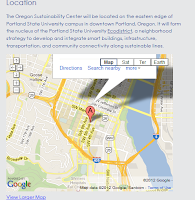 Nearby is a picture of an entire block of PSU. Then find its assessed value and how much is owed in taxes on that picture of the column of numbers. The value of the land is $28 million and change and they owe $378 bucks in tax. You may as well call it zero. PSU doesn’t pay property taxes but other buildings in this URA do. More on that in future posts. But consider this scenario offered up by a friend. Imagine you’re a city planner and you want to establish an urban renewal area. Bummer, you think. There aren’t enough paying big property owners in the area to give me enough money to do what I want to do. So you redraw the map to capture other projects that look like winners. The US Bankcorp broke ground on their complex between 5th and 6th around 1979 with the planned Tower to be in a second phase. 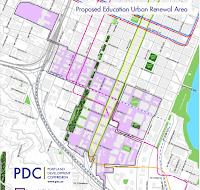 In approx 1981 the PDC drew a new UR district around the whole site to capture the Increment. The Tower was built soon after and it has been in the SW UR District it’s entire life. Virtually all of the Tower property taxes on the Tower go to UR debt. Its entire life and is still in an UR district. 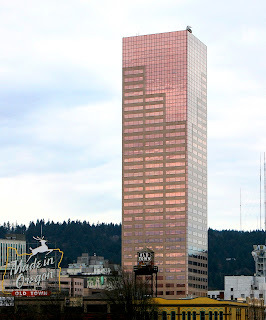 So what will Portland State University get out of this deal? This is a win-win for them. They still get their money from the state, tuition from kids’ parents and no taxes to pay to speak of. And…I’ll bet you they’ll get their $65-$90 million Oregon Sustainability Center. This white elephant is the most ardent wish of all the planner class. 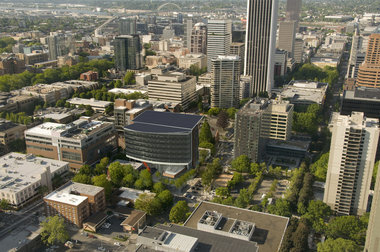 That’s because the planners will use this as ground zero for Portland’s precious planning story. But after years of trumpeting and begging the legislature said no to millions in funding for this piece of civic navel gazing. However, Sam Adams and his planners had another idea. A radical idea. Look at that map to the left. 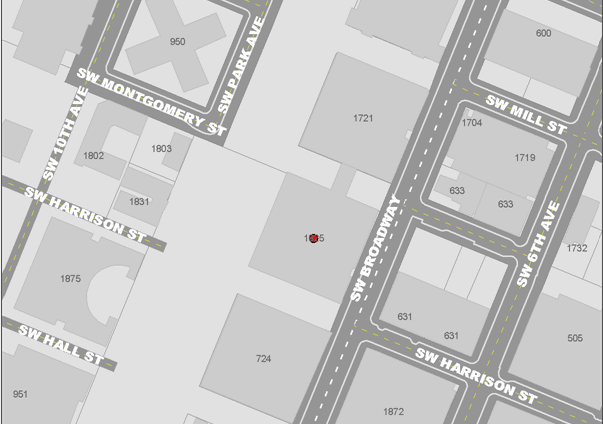 That red dot is the proposed location of the Sustainability Center. It’s smack dab in the new education URA. What a coincidence! More to come. Check this space often. PS As if on cue here’s the latest lament about the Sustainability Center. Cue the violins. Spike: Thanks for the Apology. Next Time Check Your Facts. After siccing people on the home of George Zimmerman, the shooter of Trayvon Martin, people showed up to give Zimmerman a piece of their minds and, you know, kill him and stuff. 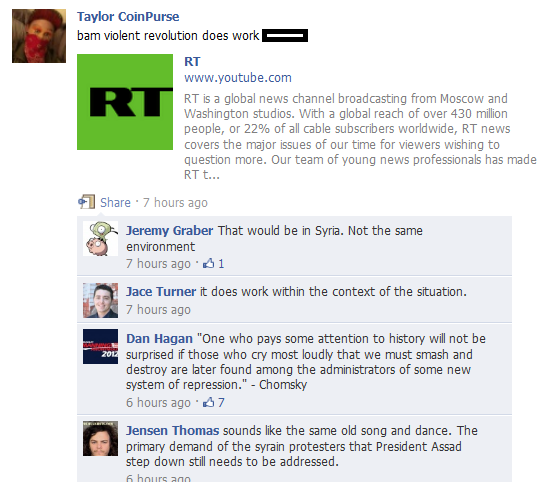 Even a bigger problem than urging people to get, read: kill, Zimmerman, sending them to the wrong house. I understand the elderly couple who live in the house at the address Spike gave out are staying in a lovely safe house. They probably won’t be able to go back home, though. Spike Lee: You’re an idiot. #Trayvon died for your sins. Scalia mentioned “Cornhusker Kickback” as if it was in final bill.Another example of how his facile wit covers lack of real knowledge. I mean, if this isn’t what it is then what, exactly, is it? H/T Christine. Move along. Nothing to see here. Unless a Tea Party person says it and then watch the fur fly from the left. What Would Mayor Nutter Say to Bobby Rush in the Hoodie? You cue is minute 28. Gateway Pundit has the story. Oy. Here. And don’t forget Spike Lee giving out the Zimmerman address here. Oh, by the way, it was wrong. But then, Spike Lee gets a lot of “facts” wrong. The left is already saying of this exclusive ABC News tape of George Zimmerman that his shirt wasn’t wrinkled and his nose wasn’t bashed in. Wow, they must have better eyesight than I do.